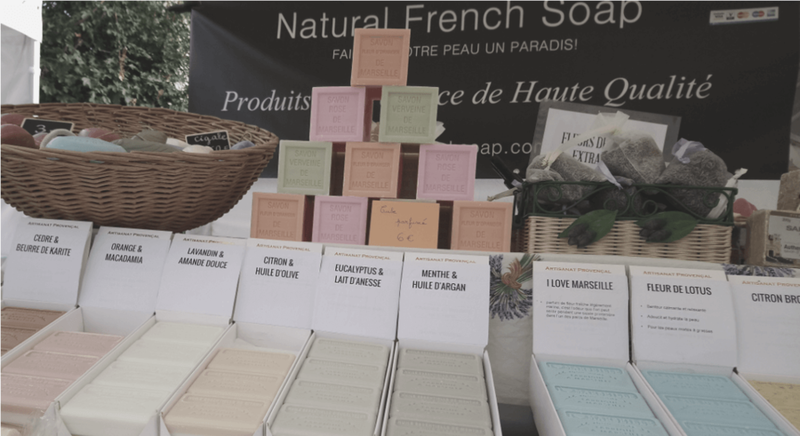 Natural French Soap offers you the chance to experience the luxury and pure pleasure of using authentic, handmade, 100% vegetal, natural Provence soaps. Whether you've already experienced French soaps from a holiday in Provence, you want to put less harmful chemicals on your skin, or you just need to find a gift for someone special, Sophie and I (Ken) are sure we have soaps that will suit you. We're so confident that you'll love our French soaps, we even offer you a money back guarantee! We ascertained that more and more people were returning to the old values of using pure, natural, authentic soaps, in an effort to rid themselves of chemical-induced, itchy, irritated skin and generally improve their well-being, not to mention doing their bit for the environment. So we started selling authentic Marseille soaps on French markets throughout the UK. Soon our customers were asking if they could order our soap when we weren't in town, so… we put our products online and Natural French Soap was born. We discovered that many companies were offering French soaps that were not even made in France and charging extra for the privilege. Our aim, therefore, is to offer the highest quality, artisan soaps, at real prices, and to bring that true scent and general essence of French life to the rest of the world, through our authentic Provence soaps. Just like most people, we find shopping online hard work, unpleasant and, frankly, a messy business. That's why we set about creating the best online shopping experience possible. We believe that 'information is king' and so we write articles, product reviews, tips & tricks, and much more for you in our Soapedia, which can be found at the top of any page. Please help us by leaving your comments. Claim your free copy of our ebook "46 Surprising Ways to Use Your Natural French Soap". This a book full of great ideas and will sit nicely on your virtual bookshelf between "39 Steps" and "101 Dalmatians", and I bet you had to pay for them!